Mama D's recipes are the source of most of my Italian-American cookery. She knew her stuff. I've added a few twists to her recipes - increased the seasonings, eliminate or reduce the salt, and reduce the oil. This is a dish that enjoyed the tweakery. 1 eggplant, hold off on slicing this til just before layering with the rest of the ingredients. Slice of the top and bottom of the summer squash. Then slice vertically so you have long thin strips. Slice the onion, and prep the tomatoes. Put each either in a bowl or on a plate so they are ready when you need them. Measure the seasonings and put in a small bowl - I love to use those little bitty custard Pyrex cups as a seasoning holding bin. Shred or grate the cheeses. Now you may pare and slice the eggplant to about 1/4 inch slices. Cover with a towel to minimize contact with air as that can make the eggplant bitter. Spray Pam on a baking dish. An 11x9 would be fine or a square casserole, it all depends on the size of your eggplant. A large eggplant would require the larger casserole, a small or medium one would make the dish just fine for the smaller square casserole. Build layers in this way: Eggplant, onion, squash. Cover with the crushed tomatoes. Sprinkle with seasonings. Sprinkle lightly with both cheeses. Repeat until the dish is about 3/4 full. Drizzle the olive oil on top of the whole. Then top with the last of the cheese. Cover and bake for about 50 minutes. Remove the lid and bake another 10 minutes or until the cheese is browning and the veggies tender. When I started making the original of this recipe (from the July/August 2012 Vegetarian Times hard copy magazine, Go buy it. It's a great issue! ), I was only going to change just a few things. Truly. 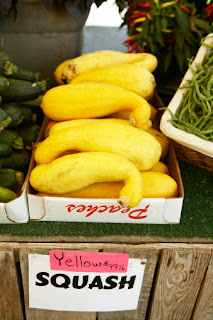 I wanted more of the pretty little yellow squashes for sure. More cheese. Definitely more garlic. Maybe fewer tomatoes... ok, and they wouldn't all be cherry because what I've got now is one purplish beefsteak, four cherry tomatoes, and a mountain of yellow tomatoes. So, I set to work chopping and being as mindful as all get out. Then we had an incredible, albeit brief, storm and a power out. An hour and a half later, I was rushing through what was supposed to be a leisurely mindful cookery time and was, well, not mindful at all. I did everything right until I got to the part where the veggies are hot, and instead of making layers, I mixed the whole thing together. So, I thought, Panko! Yes, I sprinkled Panko on top of a casserole that already had fresh torn bread in the mix, bread that I had faithfully drizzled with melted butter because it was going to be a crispy crumbly topping, only it wasn't anymore. 2 T garlic, chopped - the pre-chopped in a jar kind as I was running out of time and I always use more of that as it doesn't have as strong a flavor as fresh garlic. Put the bread and parsley in a large bowl. Sprinkle with black pepper. In a large pan, heat the butter over medium heat until it is all melty. Drizzle about half of that on top of the bread and parsley. Put the pan back on the burner and add the onion and squash. Saute for about 10-12 minutes. Add the garlic and saute for two minutes. Add the tomatoes and simmer two more minutes. Now, here's where I went deliciously wrong. Add the hot veggie mixture to the bowl with the breadcrumbs and toss. Then spread evenly in the pan. Sprinkle with Panko, then with the Gruyere. Bake for about 30 minutes or until everything is all bubbly and the cheese is turning a delicious brown. There is nothing in the world quite as ready for mindfulness as browning cheese. Enjoy the aroma. Remove from the oven and let it sit a few minutes. Enjoy as mindfully as possible. We decided that either mushrooms or sweet red pepper or even banana peppers would be good in this dish. I'm going to go the banana pepper route next time. I nuked up a bowl for lunch the next day and added some hot ground red pepper flakes. That was awesome too and may be a pre-bake addition if I know everyone at the table enjoys a bit of a kick to their food. *if you are vegetarian, do not substitute 4 T of oil. The butter is there for a reason in the drizzling part. It's what would have, if I had been mindful anyway, crisped up the non-existent topping. Now, if you want to skip the butter, use just 1 T olive oil to saute your veggies and do not bother drizzling any on your torn bread. You are just going to dump it in with the juicy veggies anyway and it will not have time to crisp, so no worries. Tortilla making is a wonderfully mindful communal activity. Your family or guests will enjoy making their own tortillas. You can enjoy the savings. My five pound package of Masa Flour cost less than one 10 pack of tortillas. Mix the Masa Flour, salt and warm water very well for a couple minutes with a wooden spoon until a soft dough forms. If the dough feels dry, add more water one tablespoon at a time. A pinch of dough should feel rather like the lobe of your ear. Let the dough rest a couple minutes. Do you think it is easy to be beaten about with a wooden spoon? Separate the dough into eight equal sized balls of dough. Cover with a damp cloth to keep them moistened until cookery time. Don't let them sit all day or they'll dry out and you will make corn crumbles instead of tortillas. a little on the thick side, but it worked great! Think gordita from "that place". Work with one ball at a time. Gently press into a round disk. 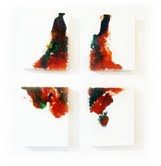 Place the disk between a folded sheet of wax paper, leave room around all sides to allow for expansion. Flatten the disk with your hand or rolling pin, until it is about 5-6 inches in diameter. After the pressing, gently remove the wax paper from each side and dust with more Masa. That way you can slip them right off the paper into the pan for cookery. Let the eight uncooked tortillas happily sit in their wax paper holding bins while you prep the skillet. Heat a non-stick skillet over medium-high heat. Gently tip and slide the tortilla into the heated skillet. You may have to experiment with technique for this. I am a klutz and find that if I try to pick them up and lay them in the pan, I make a great mess of the fragile uncooked things. Thus, the tipping and slipping. Tortillas only need to cook about 30-50 seconds on each side (if you made fat tortillas, it will take a little longer). Flip to cook the other side when the first has a few nice brown bits. Watch closely so they do not burn. It sure doesn't look like the thing will hold together, does it? So fragile before cooking. A few seconds in a skillet, and you can fold and toss them about with wild abandon...ok, maybe not wild abandon, just general abandon. You can press the second tortilla while the first is cooking, etc..., instead of prepping them all at once. That makes it a fast very busy process, but it’s fun and you don't have to worry about the tortilla drying out or sticking to the wax paper. It’s good to make that method a two person event. One can watch the cooking tortilla and the other can do the pressing. Watch out for that third person that wants to do all the eating. As the tortillas finish cooking, place them in a warm cotton cloth or in a tortilla warmer until all are ready and dinner is served. Enjoy Mindfully. *Masa Flour is corn flour that has been treated with calcium hydroxide to make the corn more digestible - the package may just say "treated with lime". It does not mean lime juice. Look for it in the ethnic section of your supermarket. The package may say "Masa Harina". Masa Flour is used to make many corn flour based Mexican treats. Do not use regular corn meal for this recipe. That would be most unmindful indeed. It may take a bit of practice to get the thickness just right. I mangled a few before they started to resemble tortillas. Fortunately, Masa Flour is inexpensive, the dough quick to mix, and the tortillas fast to cook. If you mess up, just mix some more dough! Try adding a tablespoon or two of diced Hatch Chiles to the Masa mixture. Hot or mild Hatches are fine. Cut back a bit on the water a tablespoon as the chiles will add its own liquid. To make tostadas, allow to cool and then fry in hot oil. Top them with frijoles and veggies. To make gorditas, don't roll them quite so thin. There's a big difference between a browned onion and one that is caramelized. 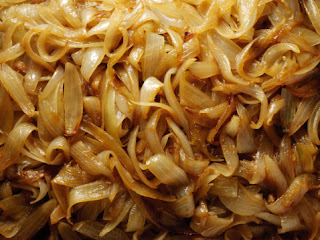 Some recipes will tell you to "caramelize the onion over medium (or medium high) heat for 10-15 minutes." If you follow those directions, you are not caramelizing the onion. You are browning it. 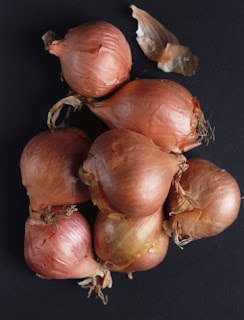 Brown onions are very good indeed, but they are not awe inspiring or caramelized. It takes a leisurely caramelizing process to draw the internal sugars out to the surface of the onion. When these natural sugars spend extended time in contact with oil over moderately low heat the onion is coated in a to die for savory-sweet ooey-gooeyness. Caramelizing onions is really just browning sugar, only instead of a cup of granulated sugar, you use onions. 45-60 minutes or until they are your favorite deep shade of brown. Medium low to medium. It depends on how hot your burners run. You do not want the oil to smoke, so err on the low temp side. Slice stem and roots from the onions and peel. Cut in half from stem to root..Cut long thin slices also from stem to root. No need to over fuss the width of the slices. As you can see in my picture, mine were a variety of widths. Allow the poor dears to rest and recover from their pain while you get the rest of the stuff in order. You can stop here or go on until they get really dark brown. Heat the pan over medium heat. When hot add the oil - the measured amount is approximate as it all depends on your pan size and how many onions you are doing. When oil gets hot it thins a bit and spreads easily over the pan. Add enough oil so the bottom of the pan is coated. When the oil starts shimmering watch it for a few seconds and marvel at how pretty it is. Then add the onions. Stir to coat with oil. Stir after five minutes. After 10 minutes total cooking time, sprinkle with a little salt - coarse sea salt is awesome here. Then reduce the heat to medium low. See, they shrink! That used to be two huge onions! Continue to stir the onions about every 5 minutes or so. Don't hang by the stove. 10 minutes is not too long between stirs. You need the onions to have contact with the pan for the caramelizing to happen. So, go do something. 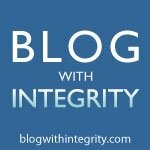 Write in your blog or read a book so you truly do forget about the onions and only stir them every now and then. After about 40 minutes you might need to hang by the stove a bit and stir more often so they don't burn. The deeper brown they are the tastier they will become. Did I mention that at this point it is absolutely delicious... I mean necessary, for culinary awareness purposes only of course, to taste a slice every now and then. Mindfully monitoring the perfection of the onions is a critical element of the caramelizing process. And, it's why I always cook up plenty of extra. 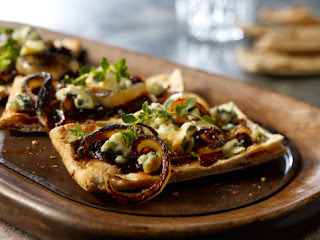 Use caramelized onions on just about anything! *On oil: some people prefer to use just butter or half butter and half olive oil. It's a total "to taste" thing. Experiment and choose your fave! they have similar, but not exactly the same smoke points and often mix well together. They do so here because the temperature of cookery is low enough that the smoking point does not enter in. Do not bother please using "light" olive oil. Either the regular or extra virgin only. **On salt: if you skip salt because you are on a low salt diet, the entire process is at peril! I don't know why this is. I just know that from experience, they caramelize better when give a few twists to the grinder. No doubt this is some of that chemistry stuff. On freezing: Make plenty - they freeze! Yes, you can freeze dollops of caramelized onions and they will keep nicely for a couple months. (parchment paper, foil sprayed with non-stick spray, in individual muffin cups, or however you want to handle the freezing of portions). They will thaw quickly on medium low heat in a skillet or in the microwave. On the Refrigerator: If you store them in the refrigerator instead, don't keep them more than a couple days as they lose their power over your taste buds completely. Enjoy mindfully while they are cooking and afterwards at dinner. Right now we are at the height of our tomato season. I really need a tomato break. Pasta served with a simple butter, cheese, and pasta water sauce really fit the bill today. Excellent served as a generous side dish with grilled eggplant slices as the star of the meal... or perhaps a side of sliced tomatoes from your garden. Measure and prep all the ingredients. Line them up as listed in the directions like nice little soldiers awaiting orders. Mindful preparation is critical for a dish like this as many of the steps overlap. This part is really is ongoing during the entire cookery stage because the sauce is prepared simultaneously with the pasta. Bring a large pot of water to a boil and cook the pasta until it is firm to tooth (al dente). Reserve three cups of the cookery liquid. Then drain and return the pasta to the pot. You can use salt in your pasta water, but it's really only necessary if you are a salter of foods. The rest of us will have plenty of salt from the bacon and cheese. Steam or nuke the green beans to crisp tender and let them sit until they are called for. Green beans are very patient things. I do this step while the bacon is cooking. Start the bacon well before starting the water for the pasta. Bacon drippings stand in for the usual oil or butter in the caramelizing process. Time it so you have time for the onions and mushrooms to cook for about 30 minutes. This is a rare instance where I will caramelize at a higher heat so the caramelizing process is accelerated. Bacon drippings can take the heat. About halfway through the onion and mushroom cookery, turn on the heat under the pasta water. To cook the bacon, heat a large skillet over medium high - any skillet with tall sides is good. When it is hot, add the chunks of bacon. Stir. Remember, you are using medium high heat instead of medium, so don't walk away from the stove. Keep a damp towel handy in case the bacon spits. After about 10 minutes, add the onion and mushroom. Continue to stir every two - four minutes until the vegetables brown well - about 25-30 minutes. Put down that spoon. Yes you. The veggies need to stay in contact with the pan a few minutes at a time or they will never brown. Add the garlic and cook 2 minutes longer. Add the black and red pepper flakes and stir. It is possible you will need to put this pan on hold (off heat or on very low heat) while watching for the water to boil for the pasta (yes, the watched pot will boil, I tested that). It's better for the bacon mix to be on hold rather than rushing to catch up with the water and ending up with inadequately browned onion and mushroom. Pay attention to the boiling water - and add the pasta when necessary. Set the timer so you know how when to check the pasta. Stir. When the pasta is merrily boiling away, return the bacon mixture to medium heat. Add the butter (if your butter was allowed to come to room temperature this part goes faster). Stir til it melts and bubbles. With a large Pyrex style measuring cup, remove the pasta water to a handy bowl. Drain pasta into a colander. Return pasta to the big cookery pot. Dump the steamed green beans into the pot of cooked pasta. Add about 1 1/2 cups of the reserved pasta water to the bacon mixture and simmer about five minutes. Don't worry, the pasta will stay hot. Add 1 1/2 cups of the Parmigiano-Reggiano to the simmering bacon water. The butter is what turns the water into sauce - so don't skip it and do not use margarine (blech). The sauce will not be thick like tomato sauce, but it will thicken a bit. Add the bacon sauce to the pot with the pasta and green beans. Stir to mix. Taste and adjust seasonings. Taste again and marvel at how good sauce can be when it is made with water. Add more of the reserved pasta water if it seems dry. Serve with the reserved 1/2 cup cheese and more pepper (both black and red) at the table. A nice salad of fresh garden tomatoes and spinach rounds the meal off very well. Enjoy with your favorite friends and family members. You could reduce (or increase) the bacon, but I do not believe the dish can stand as is without it. You'd have to make other adjustments in seasonings or proportions. If you want to eliminate the bacon, I'd suggest adding well sauteed strips of peppers - a variety of types from red to yellow to green would work well. Very good reheated and served the next day.